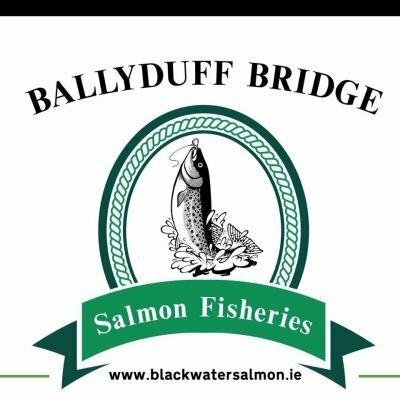 Ballyduff Bridge fisheries provides predominately salmon fishing but there can be some very good brown trout fly fishing on our beats. Sea trout are also caught on our beats when they are running. A state license is mandatory to fish for salmon or sea trout. The preferred fishing method for salmon is fly fishing with a 13ft-15ft double handed salmon fly rod outfit. In spring it is desirable to have sinking lines (e.g. sinking shooting head) and some larger salmon flies or weighted salmon tube flies. Good patterns are the green highlander, cascade, and willie gunn. Heavy leader (15lbs-17lbs) is advisable for presenting these larger flies. 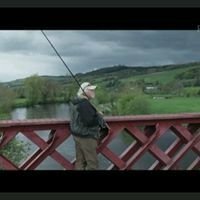 In summer and autumn a floating line (spey/shooting head) or float hover or float/intermediate is advisable with lighter (12lbs) longer leaders for improved presentation. Smaller flies such as size 10/ 12/14 salmon doubles and trebles are most productive and popular patterns include the stoats tail, silver stoat, CCK Partridge, curry shrimp, brolly gold, bann special shrimp and ally shrimp. In low water it is possible to fish for salmon with a single handed fly rod and switch rods are becoming more popular amongst our guests. Spin fishing is allowed and can be the fish catching method in high coloured water. A 10-11ft salmon spinning rod is sufficient with a good quality spinning reel loaded with 12lbs monofilament line. Lures include the ever reliable flying C, devon minnow, lane minnow, topy, and rapala. We encourage all our guests to adhere to state fishing laws and good salmon fishing etiquette. There is no state license required to fish for brown trout. All trout fishing is fly only and on catch and release basis. In the spring wet flies and streamers can be very productive. In the summer beadhead nymphs are good during the day and some excellent dry fly sport can be had in the late evening if you match the hatch effectively. A 5/6wt single handed trout fly rod would be appropriate. In low water a 9ft6 rod would be ideal but in higher water or for nymphing anything up to an 11ft rod could prove useful. Sea trout can be caught during the day but are most active just before dark. The preferred method is fly fishing with a single handed fly rod (e.g. 10ft 7wt) with a team of small flashy wet flies. Reliable patterns include silver black, black pennell, blue and silver, peter ross, surface lure and dunkeld in both singles and small doubles. In low water sea trout are often also caught on dry fly when they rise along with the native brown trout. Should the river be out of order due to flood conditions there is no need to despair. There is some excellent reservoir trout fishing and saltwater sea bass fishing not too far away!